Millet, Maltodextrin, Gelatin (capsule), Cellulose, Magnesium stearate. Riboflavin is one the B Vitamins, B-2, that your body uses for maintaining certain tissues, and energy production. Each serving of Nature's Way Vitamin B-2 contains more than 50 times the minimum daily requirement. The usefulness of riboflavin starts from the fact that your body can modify it to form compounds called coenzymes. These coenzymes allow enzymes and proteins to do their jobs, such as helping skin and digestive tract tissue growth and repair. Like other B Vitamins, Vitamin B-2 is also crucial for energy metabolism. It's a necessary part of the metabolism of proteins, sugars, and fats. Other vitamins require Vitamin B-2 to be converted into usable forms. You need certain pigments in your eyes to be able to see, and Riboflavin is a part of their production as well. 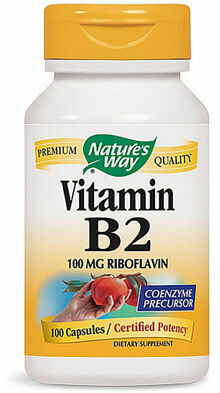 Use Nature's Way Vitamin B-2 and make sure that you’re getting enough of this crucial vitamin. 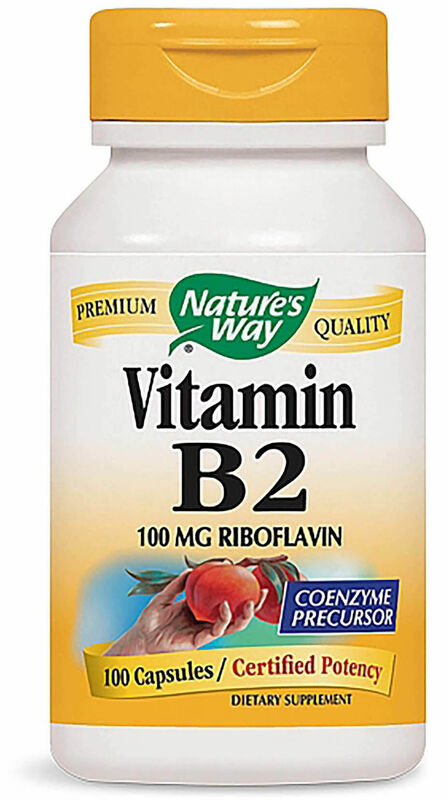 Vitamin B2 (riboflavin) is a precursor to coenzymes involved in the growth and repair of skin and tissues lining the gastrointestinal tract, as well as the synthesis of amino acids. B2 is necessary for the formation of pigments essential to vision. Our Vitamin B2 is carefully tested and produced to superior quality standards.